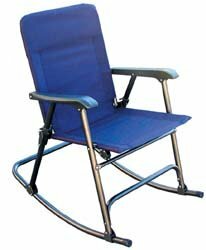 Elite Folding Chair Blue-Midnight blue fabric against a gunmetal gray frame make this an attractive folding chair that weighs 9.5 pounds and folds to about 3-1/2 inch for storage. Designed for comfort by eliminating the cross bar that typically goes across the front of most folding chairs. Tubular steel frame makes it strong. Safety latches lock chair in open position.